After living in Chicago for 3 years, I could say that despite the severe cold in winter, it was a lovely city to live in. Now that I live in Boston, I can see the differences. Boston has the history, and its historical city structure gives it a home-like soul for me. Also most of the people are either students or entrepreneurs. In Chicago, with high rises and spread out city structure, it is more like bustling city with mostly white collars. There is certainly a lot more to do in Chicago and their restaurants are by far the best I have ever been to. Definitely, Chicago is a foody city. In my 3 years of experience, of course I had some favorite places to go 🙂 And for the tourists who are about to visit Chicago, or students who are willing to study there or people who are getting ready to move there for work, can benefit from this list. I enjoyed every single one of these and most of the pictures here are from my camera. Sorry if you find Snapchat shots cheesy, but I prefer being more authentic and cheesy to being boring since I find internet photos really stereotyped. I can’t help but explain here what is happening in the pictures above: (From left to right) 1st one is Native American clothing and tools, Number 2 and 3 are the taxidermied animals (Real animals are stuffed after dying) 4th one is the minerals and where they are used in real life, number 5 and 6 are meteorites that hit the earth. Number 7 is our great great great….grandmother Lucy from Africa. Number 8 speaks for itself, Number 9 is a fossil of a fish who died while feeding on another fish! You can see the fish it ate right before dying at the bottom of its belly! Number 10 is a fossil of a turtle which shows and evolutionary fact: They used to have tails! The other pictures also belong the dinasours except the one at the bottom right which shows the mummies exhibit. Such a great art museum with one of a kind pieces. From famous “American Gothic” by Grant Wood to “A Sunday Afternoon on the Island” of La Grande Jatte painted in 1884. The latter painting is exceptionally important because even though the painting has many brush strokes of different color, when you look from far, they look unified in color! “Lincoln in Dalivision” is an original limited edition lithograph created by Salvador Dalí and it must definitely be seen. Also, Van Gogh’s exhibition is still on. This aquarium has all the sea animals that you love, from penguins to seals and dolphins. Let’s not forget the scary sharks. I know that some people are against zoos. I will not argue it here but I really learn a lot about animal kingdom whenever I visit a zoo. Especially our ancestors, apes fascinates me! Lincoln Park Zoo is free and open all year around. During Holiday season, they light the whole zoo up with Christmas lights. It is gorgeous. Also, the zoo has one of the best skyline. Here you can see we are trying to get the skyline in the background at the Zoo, I should confess, we kinda failed it. Lincoln Park Conservatory is also free and it exhibits all kinds of flowers and plants from all around the world. It is just by the zoo and definitely worths a visit! One of the most historic tourist attraction in Chicago. Navy Pier is beautiful despite the fact that the tourist crowds really get tiring very quickly. Many places to eat, drink and enjoy the scenery. Some of the cruises sail from here if you want to take a lake tour. Navy Pier is famous for the oldest wheel in the US, The Ferris Wheel. It runs as long as there is no issues with the wind. If you are not afraid of height and a patient person in general, definitely you must experience the Skydeck. You can see beautiful Chicago from the 103rd floor of Willis tower, and step on the glass balcony to feel like you are flying. I told you you need to be patient because especially at the weekends, the line gets reallyyyy longggg. But it gives great pictures for instagram 🙂 Here you can see my friend Mehmet and I posing at Skydeck. Chicago beaches are amazing. You can take a walk, ride your bicycle, run or in summer you can enjoy the sand and cold water 😀 They are clean and not terribly crowded. Bring your sunscreen though! Because with the wind, you don’t realize you get sun burned. Trust me on this, experience is speaking. The most popular beaches are Montrose, North Avenue and Ohio Street ones. Pictured: My friend Ipek and I taking a walk by the lake, walking towards North Avenue beach and my friend Ximena and I at the Montrose beach. The only river in the world that its course was manually reversed: The Chicago River. The reason it was reversed is that the sewage was flowing into lake before and the drinking water is supplied from Michigan Lake. So, clearly that was a problem. “The River Walk” is a very fun late afternoon activity, if you ask me. There are bars and nice restaurants aligned near the river and if you want you can rent a kayak, as well. There are tours taking off from here and showing you the beautiful architecture, the river walk and then the lake. I highly recommend the night tour of the river and lake combined. I have taken one and the skyline at night was magical. If you are 80s’ kid like me you know what number 23 means. Michael Jordan’s posters were all over my wall in Turkey, I was a huge fan of Chicago Bulls! It is not quite the same anymore and they are not as successful as they used to be, but this is even better because their NBA tickets are more affordable! 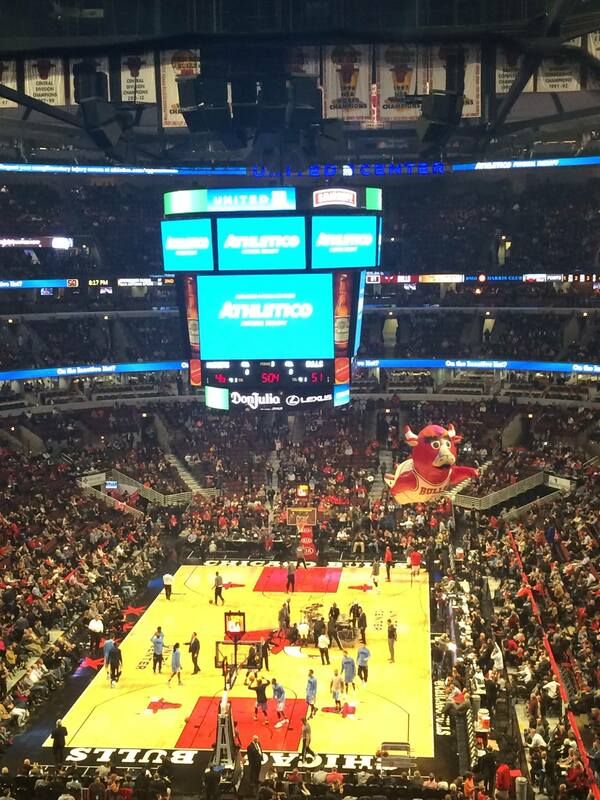 If you are going to Chicago, definitely experience a Chicago Bulls game. Broadway is a must see, if you are travelling to the US. Generally it is expensive, but, trust me on this, it is worth every penny. Broadway originally belongs to New York City. But as the shows tour, they always stop by in Chicago, as well. This one below was one of the shows that I went to. When I used to teach Reading class at Inanc High School in Turkey, I used to teach this book. It was amazing to see how it was turned into a Broadway show. One of the things I miss the most in chicago is the stand up shows. Zanies and Laugh Factory are the two most famous places to go. I also persoally enjoyed Improv Chicago shows at IO theater a lot. Every Wednesday there was a free show! Greenmill is one of the oldest Jazz bars in the US and they are still running in Uptown area. I have been there many times, there is a cover charge and I recommend you to go there as early as possible to get a seat. You will see a video below from one of those nights. After music starts, they won’t let you speak, just saying. Literally they hush you. Also, House of Blues or Blue Chicago are among the best Blues bars. Definitely your soul needs some jazz and blues time! If you like or you want to practice Latin dancing, Chicago is the best place. Sunday Evenings there is Salsa night at Cubby Bear Chicago, and I used to go to Lalo’s Mexican Restaurant for salsa, bachata or merenge. They had free salsa lessons on wednesday evenings and their food is great! There is also Nacional 27 which was very popular among my students, but I have never been there. In Chicago, it is hard to find a seat if you go to the place after 7 pm, so plan accordingly! There are so many festivals in Chicago during the summer. Most of them are food festivals but there are music, cultural and movie festivals as well. Check www.timeout.com/chicago for current and upcoming events in Chicago. When the festivals start, you can see their schedules here. This place has been rated as the best burger place in the US. I cannot say it is the best since I haven’t eaten burger everywhere in the States. However, the best I have ever eaten so far. The only annoying thing about it is the wait line. Don’t ever think that you can eat there at the weekends. The kitchen closes at 3 at the weekend and when I went there at noon, they put me in the wait list. My turn didn’t come in 3 hours!! So I had to eat somewhere else. But, once I went there at 4 pm on a Friday, and it was half empty. Again, timing is important. I would say usual wait time is 2-3 hours. That is why it is the best option to wait across the street, at the bar called ‘Haymarket’ because they have delicious beer flights and pretzels. Perfect place to wait for your burger. Once your table is ready, Au Cheval texts you and if you download their app, you can actually see how many tables are in line before you. Definitely worth the wait for me. You can see here how much my friend Meltem and my brother Ege enjoyed their burger at Au Cheval. Below, you can see Mehmet and I enjoying the beer flight at Haymarket while waiting for AuCheval. Meltem and I were at Haymarket, too and tried their best IPA, Mathias. It was fantastic. OK pizza is from Italy, we all know that. But deep dish is super American. Lightly burnt crust, fresh ingredients and the homemade taste. Oh and also cheese, lots of cheese. That’s Pequod’s deep dish. When in chicago, you will here ‘Lou Malnati’s’ and ‘Giordano’s’ fans fighting over who makes the best deep dish pizza. You can argue and try all of them but, I will save the time for you, go and eat at Pequod’s. Not only the taste but also the environment is much better. One time when I went to Cho Sun Ok with my Korean friend, she had said this was the closest thing she ate to real Korean food that you find in Korea. The food is AMAZING. Especially their seafood pancake and their small plates. They are incredibly cheap as well. Like almost every restaurant in Chicago, it is BYOB, meaning you can bring your own booze to drink. One thing to keep in mind though: They have a very small restaurant and they are popular. So they are not the politest servers you will see. They are racing with time. They are abrupt and quick. Also, expect wait lines during rush hours. Well, of course I needed to fix my Turkish food cravings! Turkish food is not going to be the cheapest, but I swear it will make you feel like in heaven. These two restaurants were my favorite. They both serve Turkish breakfast with fresh bread and unlimited Turkish tea, so please please make sure you try Turkish breakfast if you can. My other favorite food, Venezuelan cuisine. Their tequenos and arepas are the BEST! If you never tried Venezuelan food, please pay a visit to this restaurant in Chicago, you will be addicted! This European restaurant is too overpriced for students. But… If you are celebrating an anniversary or a birthday with a special one, definitely this fondue restaurant is the romantic choice. I have been there only once but definitely planning to go back. There are discount coupons available at Groupon. Also, do not forget to make a reservation 3 weeks in advance. I apologize that I can’t use original pictures here since it was dark inside and my photos didn’t turn out good. But I’m using the photos from their website here. This place has the best margarita bowls and loaded fries. Also in summer, their outside patio is the best place to stay cool. There are many locations now but the best one is the original one located at 430 N. Michigan Ave at Lower Level. 3-5 dollar beers and cheap burger and snacks. Wonderful option to get have a quick happy hour with your colleagues or catch up with your friends. At the weekend, if you want to have American breakfast: ommelettes, pancakes, waffles, breakfast potatoes, sausage and eggs, bacon, etc. These two places are my favorite. If you can find a local one, that is great. But till you find that, these are pretty good options. Me and my friend Aisha at Yolk for breakfast. Yep, I got my mom here too! If you like Spanish tapas and want to enjoy a live flamenco show while eating your delicious food, this restaurant is for you! I really liked the potato and fried calamari there. And the performance was impressive. They have the tastiest, juciest kebabs. They are definitely one of a kind. Also, the portions are so big that you will have to take some home. If you want to try different kinds of flavored wings, this is the place. They have a very good selection of beers and their garlic parmesan fries are absolutely delicious. If you want to play old video games and enjoy your drink, this is the perfect choice. There are many other arcade bars but Emporium locations are bigger and central. Their menu is a little expensive but its atmosphere is so calming, elegant and chic. If you get a nice seat, you can enjoy your book by the fountain or chat with your friend in the middle of the courtyard. This is also a furniture store so you can walk around after and enjoy different selections of furniture. I tried their lobster panini and it was delicious. This is a neighborhood dive bar with a fireplace and free popcorn. They have karaoke and trivia nights as well. It is a quiter environment if you want to chat with your friend in not-so-loud environment and still enjoy your drink. All in all, Chicago is a great place to be. That is why despite the cold, a lot of people cannot give up on this beautiful city. I don’t think I will move back again, but I left my heart there and I’m definitely going back there to visit and EAT! This post is about shiny things, global traditions and Jesus. Most people celebrate the birth of Jesus Christ on December 25th and some on January 7th (For example in Russia). For some people, the night of 24th is the time of celebration (For most Catholics) and for the others, the celebrations including the church ceremony and dinner takes place on the 25th. Although Christmas is a Christian holiday, today it is more cultural than religious and it is celebrated by billions all around the world. Weirdly enough, in a Muslim country like Turkey, Santa Claus and Christmas decorations are figures for New Years, since we do not celebrate Christmas. Santa Claus’ Turkish name is Noel Baba (Father Noel) and his pictures, toys and sculptures can be found in every mall and around the city during December. Before I talk about Christmas in the USA, I also want to mention how it is observed in other countries. In Korea, Christmas is a national holiday, but they don’t celebrate it as a family holiday. It is more of a romantic one, like Valentine’s Day. In China, one tradition that is becoming popular, on Christmas Eve, is giving apples. Many stores have apples wrapped up in colored paper for sale. People give apples on Christmas Eve because in Chinese Christmas Eve is called “Ping’an Ye” (平安夜), meaning peaceful or quiet evening, which has been translated from the carol ‘Silent Night‘. The word for apple in Mandarin is “píngguǒ” (苹果) which sounds like the word for peace. The United States of America has many different traditions and ways that people celebrate Christmas, because of its multi-cultural nature. People in America like to decorate the outsides of their houses with lights and sometimes even statues of Santa Claus, Snowmen and Reindeer. Do you want to see what these lights and statues? Here are some pictures. Some cookies and glass of milk are often left out as a snack for Santa on Christmas Eve! Christmas Carols and making ginger bread houses are also among American traditions. Families buy Christmas trees and decorate them together. Stalkings are hung buy the fireplace and gifts are left under the tree. First thing on Christmas mornings, kids open their gifts and after the church ceremony they come back home and enjoy the feast. Although it is called dinner, it susually starts anywhere between 12:00 PM- 2:30 PM on Christmas Day and Turkey is a classic member of the Christmas dinner. In the US, The holiday season starts with the Halloween Day, October 31st. Thanksgiving is the last Thursday of November and then Christmas is on December 25th. Every store will have holiday-themed everything. People shop like crazy. Due to Christmas gift shopping frenzy, the days like ‘Black Friday’ and ‘Boxing Day’ were born. Black Friday is the day after Thanksgiving in the US and everything is on sale, so people line up (or beasically camp) in front of the stores from the early morning hours. Then they litterally run in the stores when the doors open. Boxing Day (in the UK) is the day after Christmas, It is a time when shops hold sales, often with dramatic price reductions. On Christmas, you HAVE TO buy a gift and gift cards are a big tradition in the US. So you have to get a card together with your gift. There are many creative and fun cards out there but they can be as expensive as your Christmas gift! Honestly though, I still find the gift cards waste of money since you only look at them only once. One thing that amazes me in all this, is the beauty of the gospels and Christmas songs. I have attended many church services and some Bible studies in Kansas before. I don’t consider myself as a religious person (Especially after seeing religion bringing more harm than good to people these days) but I love studying the cultures and they come with religion. Although I was from a Muslim country, I always felt welcomed by the people at the church. They were always so kind and positive not only to me but also to each other. It has been amazing to see how they enjoy their worship when they are singing together, united, with one love: Love of Jesus Christ. With their simple but powerful lyrics, but most importantly wonderful melodies, here is my favorite five gospel songs. It is hard not to enjoy these no matter you are Christian or not. I also tried to choose the best versions of them. Hope you enjoy! PS. if you haven’t seen this video below before, please watch in order to see how important the Christmas gifts are for American kids. This video is hilarious. Why do I LOVE Boston? I have lived in three cities in the United States: Lawrence (Kansas), Chicago (Illinois) and Boston (Massachusetts) and although I had really good memories in each one of them, I ‘fell in love with’ only Boston. Chicago is a great city with its infamously delicious food and fun jazz and blues bars. Lawrence is one of the best college towns to live in the US: Cheap, international, and very unKansasly liberal. But Boston… With its historical composition, its college town feeling -despite the fact that the city is also a business center, its beaches and gardens among the brick houses (instead of high rises) and its young profile make Boston unique for me. In this post, I will share my reasons with you and in the end you get to decide if I’m right or wrong. But before all that I want to remind you about Boston’s history, since it plays a critical role in the United States history. The history of Boston plays a central role in American history. In 1630, Puritan colonists from England founded Boston and helped it become the way it is today. Boston quickly became the political, commercial, financial, religious and educational center of the New England region. The American Revolution erupted in Boston, as the British retaliated harshly for the Boston Tea Party and the patriots fought back. They besieged the British in the city, with a famous battle at Bunker Hill in Charlestown on June 17, 1775 (which was lost by the colonists, but inflicted great damage against the British) and won the Siege of Boston, forcing the British to evacuate the city on March 17, 1776. However, the combination of American and British blockades of the town and port during the conflict seriously damaged the economy, and the population fell by two thirds in the 1770s. The Irish Catholics, typified by the Kennedy Family, took political control of the city by 1900. This is why you can still see a lot of Irish bars and Irish heritage all around Boston. Now that we know about the history, I can start writing about the greatness of this fabulous city! Swans swimming at the Boston Public Garden during summertime in Boston Massachusetts. Single exposure HDR image tone mapped in Aurora HDR. In Public Garden,you can take swan boat rides or you can do a picnic. There are always street musicians or performers to amuse you during the day. Street food (especially Arepas and pretzels) is something you will definitely come across. The Arnold Arboretum of Harvard University is an arboretum located in the Jamaica Plain and Roslindale sections of Boston, Massachusetts and it is my second favorite natural place in Boston. You can see hundreds of different tree and bird species. There is also Charles River Esplanade which is another place to escape the busy city life and enjoy the beautiful nature. Boston is famous for its brick buildings and its city planning is breathtaking. Just walking around the buildings gives a weird sense of peacefulness to me. In Chicago, the architecture was great as well but I think it was making the gap between the rich and poor too obvious for me. However, in Boston, I can’t easily see that distinction by just looking at the architecture. It makes Boston look like a modest city. One of the best things about this city is that it is small enough to walk everywhere, but it is big enough that there is ALWAYS something to do. There are so many coffee shops (My favorites are Thinking cup and Cafe Nero). Also, they have the best homemade hot chocolate in the country! Indian, Italian, Greek, Chinese, Korean, Thai, Turkish and many more cuisines can be found at different restaurants everywhere. There are bowling alleys, improv shows, concerts, festivals, there is ‘The Boston Marathon’, there are canoe and boat rides on Charles River, there is the New England Aquarium that everybody should see. In summer, there are whale watching activities. Boston Red Sox is one of the best baseball teams in the World. You can watch them at Fenway Park! Although it is usually too cold to swim, you can enjoy the sun at the beaches of Boston during summer. LA Burdick has the best hot chocolate!! There are many good Irish Bars or other restaurant/bars in every corner. Especially in Downtown Crossing, Back Bay, South End and North End. North End (AKA Italian Neighborhood) is famous for its Italian restaurants and bakeries. Union Oyster House is one of the famous Irish bars. You should try their Clam Chowder! Coogans is in downtown and it is famous for its cheap beer options. As a person who LOVES reading books and who is always thirsty for knowledge, I feel so lucky to be in Boston. Being home to Ivy league universities such as Harvard, MIT, Northeastern and BU, Boston has a lot of students, which explains the high number of museums and the bookstores in the city. Boston Public library is open to everybody. You don’t have to go get a library card to study, but if you want to borrow books, of course you need one. The library has two sections: the historical one and the modern (Boston Library Central) part. There is a huge bookstore at Harvard square called ‘Harvard Book Store’ in which the atmosphere reminds me of Hogwarts in Harry Potter series for some reason. It has a large selection of books, besides a mini cafe inside. Additionally, there are many other bookstores in the city selling both brand new and used books. But my favorite one is the one near my work in Downtown Crossing: ‘Brattle Bookshop’. Harvard University Campus id open to visitors all year around. Brattle Bookshop, where you can buy used books for as low as $3 or $5. As I mentioned before, there are several good museums in Boston. The best thing is, most museums have free admissions after 5:00 PM! So after work or after school you can still enjoy a visit to a wonderful museum…For FREE! When I used to live in Chicago, one thing I realized was how segregated it felt. Downtown was mostly white collar white Americans, Southern Chicago and Uptown was black, Chinese lived in Chinatown, North had a Muslim neighborhood and around Kimball, there was the Hispanic neighborhood. Although there is a Chinatown here and Chelsea, in Boston is predominantly Hispanic, I can say that due to its college-town identity, it looks well-blended. The other day I was walking down from Brookline to Allston. Brookline is mostly Jewish. I left the Greek Cafe ‘Athan’s Bakery’ (They had great desserts there). On the way, I over heard a Russian mom speaking on the phone and walking her baby, three Korean college students were walking pass by me. Later, I heard some English (not surprising, is it? :P) Then, this Turkish couple just walked into a nearby Starbucks. After that I stopped by at the Liquor store to get beer and paid to the Indian store owner. when I talk about being multicultural, do you see what I mean? Because everybody is either a student, or a teacher, or admin, or businessman/businesswoman , you can feel the above average IQ in the air. Of course there are some things that I don’t like about Boston. Two things to be exact: The housing prices and the cold, long, snowy winters. The housing prices are outrageous. The rent for a studio apartment (NOT in downtown but 20-40 min train ride away) starts from $1400, one bedroom starts at $1700. If you want to live in downtown, it gets even more expensive. If you want to rent just a room it starts from $900 per room. These are ridiculous prices because Boston is small and can accommodate only certain amount of people. As far as the cold, long, snowy winter is concerned, after Chicago, I can’t complain 😀 I find Chicago winters even more brutal and I survived 3 of them. It is easier for me to handle Boston. But some people hate the weather and leave, I respect that. Hope you enjoy this read and you find it helpful! Write a comment below if you have any questions or share it if you like it! When I came to the USA in 2008 for the first time, I was in so-called ‘honeymoon stage’: Everything was new and exciting. Even my jet-lag. I was ready to explore, meet new people, eat new food, buy new clothes. However, after about a month, I started to feel frustrated, lonely and tired. Everything was so different that learning curve was painful. So many things that I had to figure out ‘by myself’ and when I couldn’t figure it out, there was no one to cry to. I was really depressed for the first 4-5 months in the USA. I had constant headaches and dark circles around my eyes. In this post, I would like to share with you the things I wished I had known before I arrived. Although I believe that learning these by experiencing on your own would be challenging but fun, also I know that a lot of people eventually go back to their countries because they can’t cope with these challenges by themselves, especially in the first critical 1-3 months. Statistics say that around 34% of all new college students will drop out in the first year. One of the main reasons is homesickness. If you want me to define ‘homesickness’, it is not just missing your parents or best friends. It is losing the sense of ‘belonging’, also the fear of the ‘unknown’ and lacking the strength to fight with ‘problems’ as they hit hard one after another. I remember one day I missed the bus to school which was running every 30 min. I was running late for the class, so I had to walk to the class in snow. But half way to the school, I realized that my cute looking boots that I bought from Turkey were not suitable for snow. By the time I arrived my class, my socks were soaked in snow water. The very same day I learned that for my thesis, I needed to go on a field trip and camp for at least 40 days. The problem was, I hadn’t had a car or driver’s license at that time, I hadn’t camped in wild at all, not even for one day. Then of course in the evening I felt sick because of the cold and I remember shivering and thinking to myself: If I die here, nobody will know. I’m so alone. The car I had to buy with the help of my American family and my campground for my thesis work. I camped 40 days alone in Wilson, KS. There were stormy nights and weird animals around. My allergies were killing me and sun was burning my skin no matter how much sun screen I applied. As I mentioned, it was very difficult for me to adapt the host culture. It took me 5-6 months to start feeling normal. I was home all the time, watching movies and doing homework. I wanted to make friends, go out and explore. But I needed a car to go anywhere in Kansas and it was too hard to make friends. Americans seemed like they were communicating among themselves very effectively and confidently. Yet, I felt like I was left outside. Masters students at Geology department were doing projects together, were going to a bar (Henry’s in Lawrence, KS to be exact) every weekend but nobody was inviting me. That made me feel rejected… How was this even possible? The social butterfly in Turkey (me) had turned into a caterpillar. Then, we went to this Spain field trip. I was staying with 5 other friends in the same hotel room. We finally started talking about things that are different than geology. We went out at night and we chat about everything. We were laughing, dancing. The whole week we spent in Almeria, Spain, I had gained a part of me back. I thought to myself “I’m still lovable and respectable”. After we returned to KS I joined their gatherings a lot more. When I confessed that I was waiting for an invitation, they were puzzled. They asked me why I waited for an invitation. They said they were discussing about where to go right in front of me, that meant I was automatically invited! Oh boy, how could I know that?! Then as I read about it, I realized that it wasn’t only me! There was a science behind it. They mapped the psychological ups and downs. Now, you can learn about it too here and I hope that it will help you during your journey. During the first stage, Anticipating Departure, you go through mixed feelings. You are anxious about leaving your family and friends behind. You are trying to be excited but the fear of the unknown still makes you feel on edge. Upon entering the new country, your excitement will be at its top level. This level is called ‘Honeymoon Stage (Emotional High Point)‘. This stage lasts about 1-3 months. Everything is new, there are so many things to explore, so many things to take picture of, to taste and to smell. I still remember the smell of the BBQ sauce on the first ribs that I tried. And the taste of fried pickles. The smell of Britney Spears perfume (There were so many cheap perfumes everywhere). Also, I remember taking a picture of birds and bugs. They looked and sounded different. At this stage, I was like a tourist and I was enjoying it! Then comes the Critical Low Point. This was the time when I first realized that I didn’t have anyone to share this excitement with. This was the period that I realized, in order to buy a toothpaste or a loaf of bread, I had to drive to Walmart which is 10 minute drive from home. There was a little problem though: I didn’t have a car. I didn’t even have a drivers license. Then I realized my masters program was way different than what I was expecting (It is way different than Turkish education). So much homework, so many lab and field reports. Proposal, poster presentation, application for scholarships and funding, everything had strict deadlines. Besides, my adviser was horrible, so it didn’t help my adaptation process at all. I remember crying in front of her once. I truly think she didn’t care. Our Turkish community in Lawrence, KS. My best friend, Aslihan, who helped me adjust my new home, is sitting right in front of me. The fourth one from right standing is Zeynep Abla and the first one from right sitting is Fatih Abi, who helped me a lot during my adjustment period. Being a part of the International Student Association and International Student and Scholar Services was the best decision I have ever made. ‘Confronting Deeper Issues‘ is an interesting stage. Because this is the stage after which you decide to stay or go back. Also, if you decide to stay, this is the stage that will make you more mature than ever. This is the time period that your communication with your home country gets little disrupted: Some friends of yours stop talking to you, or they get really busy with their own lives that they become not as available as they were before to chat. Suddenly when you look around, you see that you are living in a dorm or in an apartment with used furniture, your school work is a constant struggle, you are still trying to figure things out: You are trying to understand why your new friends are not checking in even though they know that you are sick. You are still trying to figure out how to open a bank account and call the bank when a problem arises. You, for the first time in your life, shovel the snow. You can’t figure out why your engine is not working after a freezing night. What is that scary storm alarm? Why do you have to make reservation for a taxi 24 hours in advance?? What is a social security number and how do you get it? What is credit history? Why do you even need it? How do I pay taxes here? While working on those complicated issues, your friends and your relatives in your country are getting married, getting promotions, celebrating birthdays, having babies. Your family members are having health problems, and you can’t be there. This feeling of ‘helplessness’ -can’t help anyone, can’t even help myself- is a real struggle. Because of these negative feelings, you will tend to focus on negatives, so you will start using phrases like “This is easier in my country” “This tastes better in my hometown” “In my country, they do this way differently! Ugh” So this is why it is called ‘deeper issues’; you question everything: your family and friendships, YOU and your country’s weaknesses and strengths. This is the stage you analyze all the ups and downs you had. ‘Adapting and Assimilating Stage’ is the best. You realize that you can enjoy the new culture while still keeping your core values. You accept the difficulties, find ways to solve them. You accept the good sides and bad sides of your own country and the host country. For example, I really like how people respect you as an individual and give you your own space in the US. Also the fact that the system rewards you if you work hard. But I still miss the warmth, friendliness, helpfulness and randomness of people in Turkey. In this stage, your small circle of friends and acquaintances keep you occupied. Finally, you start traveling or focusing on your hobbies. Finally, you think about buying new furniture for your apartment, maybe some plants, some photos and paintings? You start to invite people over and cook for them. You start to find what to discuss with Americans since you know the local sports teams, TV shows and local news. You enjoy the cultural exchange; learning about their culture and teaching yours. Finally there is this ‘Reverse Cultural Shock‘ stage which is labeled as ‘re-entry adjustment‘ in the chart. After you adjusted yourself and accepted your host country as your ‘home’, going back will be a different experience. Your people will be more different than where you left them. It will be hard to explain them what you saw, what you experienced. Some of them won’t understand very easily. They might underestimate the difficulties you went through and think that what you encountered could not be such big deal because you live in the strongest country in the world. You are finally in your country, the food is great, you go to the places that you missed, meet up with people that you love but then you can’t help but focus on rude people, traffic, long bank lines, smokers, governmental procedures, so many things that will annoy you, and you wished that were different. You will have difficulty adjusting back to your own culture. Frankly, I think this was the weirdest feeling that I experienced in this all adjustment period. Get involved! Socialize. This is crucially important. Put yourself out there. Sign up for a student organization, or find your country’s cultural group, or join meet-ups. Go to school gatherings and talk to people. Don’t be afraid about your English. People in America are used to accents. Also, you are the one who knows two languages! I have found it easier to socialize with international students or expats rather than Americans because we all were going through the same issues. Make your living space unique, your style. Place things that will give you positive energy around your room: Pictures of your family, your best friend’s gift, your favorite book, a Star Wars poster, a fish tank or a cute little plant. Make your living space your ‘shelter’ your own ‘peaceful space’. If you are a student, contact your school’s international students services office. Learn about activities, deadlines, etc. Talk to your family and friends back home via Whatsapp, Facetime or Skype regularly. It really helps. Stay connected with your peeps on social media. If you don’t have one, open a Facebook, Twitter or Instagram account. Get hobbies! You can keep the old ones or you can find new ones. You can read a book, write a blog, take drawing or dancing lessons. It is always great doing something different than papers and work. Get an on-campus job if you can. It keeps you busy, allows you to meet different people, besides you make some pocket money! Save money for your future trips! There are so many places to see in the USA! You would like to visit these places before you leave. Exercise! When you start exercising (at gym or at home) you will be in a way better mood. Eat healthy food. Eating crappy food everyday will also make your mood crappy. Be careful about parties. American colleges are party lands. They start partying on Thursday and it continues till Sunday. Of course it is your right to join these parties and have fun, but do not forget about your reason to be here. Do not get side tracked, or alcohol poisoned. Walmart is the world’s largest company by revenue – approximately US$480 billion according to the Fortune Global 500 list in 2016. Its grocery stores are humongous. In the US, most cities do not have a good public transportation. This wasn’t a problem for my Saudi Arabian students who mostly drive anywhere back home, but if you are from Turkey, you might have a difficulty getting used to driving everywhere. When I lived in Chicago public transportation was great. There were two trains running 24 hours. You could go anywhere in the city by buses or train/metro (known as ‘L’). In Boston, also the public transportation works pretty well. You can definitely see public transportation in New York City, Jersey City, Washington (in Seattle), Philadelphia, Los Angeles, and San Francisco. But other places are usually a hit or miss. So please arrange your budget accordingly: Are you going to need a car? How much are second hand cars? How do you get a driver’s license? Chicago L system. ‘Brown line’ goes through downtown loop area. It was around midnight when I woke up from my sleep with sounds of gunfire in my apartment in Uptown, Chicago. Someone was killed in our backyard. It was a gang crossfire. Then I couldn’t help but think ‘What if I was taking the trash out at that exact time?” I wished I had lived in a safer area. Bear in mind that the less safe neighborhoods will have cheaper housing options. So, if you are going to live in an apartment, and you are looking for cheap rent, make sure to check the crime rate online. One of the options you have is here: Go to http://www.mylocalcrime.com to check the crimes around the area you are planning to live in. Don’t forget, there will always be some sort of crime reported. Americans are pretty good about reporting a crime. Please check the climate and weather information about the city before you arrive. Some people cannot really survive in cold and in some cities in the US it is brutally cold, especially if you are from a country that has warm climate. My students from Turkey, Brazil, Colombia, Saudi Arabia were complaining about how cold Chicago and Boston were. But my students from Northern Europe and Russia were totally fine with it. Also, don’t forget to check the weather everyday before you leave home, because it might change pretty quickly. Here are two videos about two extremes: A little girl Mila is talking about Arizona summers (42 Celsius-average, 49 Celsius recorded) and in the second one you see a news report talking about last December’s arctic wave. Lawrence, KS downtown (city center), Mass Street. Doesn’t look like New York City, does it? Learn what your city offers and what its limits are. For example, if you live in a bigger city, your chances of finding a market that sells ingredients for your cuisine are high. Also, if the city has colleges and these universities with international students, then you are lucky. Again, you probably will find some international markets or restaurants in your city. But frankly, don’t expect to find Iskender kebab in Idaho, or grape leaves in a market in Mississippi. However, one thing I learned about America is that it can surprise you. So, I cannot speak for sure. Do not bring your electronics here other than your computer and phone charger (if you need to). Because of the voltage difference, your electronic devices will break down. While it is 220-230 V in most European, African and Asian countries, it is 120 V in the US (https://www.worldstandards.eu/electricity/plug-voltage-by-country/). It happened to me with my toothbrush charger, hair straightener and epilator. First they worked slowly, then they completely stopped working. Besides, you will need a converter (see the image) if you are using a device from your country in the US. As you can see ‘ER General’ Says $976. Let’s say your insurance will cover half of it. You still will need to pay about 500$. Also, let me remind you, monthly insurance payments vary but they can go from 150$ to 500$ a month. So, please do not get sick in the US. As you can see, there is a huge gap between the medical costs in the US and in other countries. One might argue that the equipment used is the highest technology and that is why the costs are high. Although I believe this is partly true, there is also the fact that hospitals are trying to find ways to get more of your money. If you are rich, you get the best treatment. If you are poor, you might get a below average treatment and we don’t care if you die in 10 years. I’m not talking about doctors or nurses here, I’m talking about the health system. Insurance is also such a complicated issue that (deductibles, in network versus out of network, HMO PDO plans, etc) I still have many questions and confusions even after 6 years I spent here. As you can see from this email, the person is in Alabama and he will ‘mail’ the keys to them once the buyer sends the security payment. Do not fall for this, my friends. No realtor, no landlord will ask for your money without meeting face to face. They would NEVER mail you the keys, either. Look at all the grammar mistakes he made! Especially in the last paragraph: “My job factor” “very saddened (without ‘I am’)” “very perfect (no native will say this)” “you meet up with application process?? (haha application process is a person’s name I guess)” “my keys will be mail to you (Wrong passive voice usage)” and nobody will use “God” in their ads. This is also a big red flag. Another thing that you should be careful about is the phone calls you will get while in the US. I remember one time a person called me and said they were from “Credit Card Protection Services” and my card needed to be protected. They had a jingle and everything when they put me on hold. They sounded real! But then he insisted on learning my credit card number. I was trying to be polite but at that moment I understood that they were just a scam. Your phone or internet company, maybe AT&T, Xfinity, etc. They will keep calling you as well. They will try to convince you to upgrade your plan, which means you will have to pay more. I remember when I first moved in the US, I got a call and the person was speaking English with a heavy Indian accent and he was so fast that I had no idea what he was talking about. After saying ‘Could you repeat please?’ like 2 times, I gave up and I started to say ‘Yes’ to everything he said. After about 3 and a half minutes, we hung up. Oh Lord, at that moment, I was so relieved. Well… The following month my telephone bill came and it was 250$. Apparently I had upgraded my internet and phone to the most expensive plan!!! It was painful to call them back and fix everything again. Before you come tho the US, you have to learn about American culture. While most western countries have similar cultural elements with Americans, when you compare Asian, African, Latin and Middle Eastern culture to America, you get a very different picture. I can only speak for my own cultural experience, of course. Americans will have this distance from you that is called “personal bubble”. Forget about getting intimate on the train, in the movie line or restaurants. Forget about giving a warm friendly kiss to your friend on the cheek. Forget about giving random hugs to your colleagues. Oh and of course, forget about hand jokes including hitting on the head or back. My American friends walking down in Taksim Square, Istanbul were so confused with the fact that guys were walking arm in arm, girls were holding hands but they weren’t gay or lesbian. They were just showing friendly affection. Also, not only at work or school but be aware of the personal bubble in the customs at the airport. One day, one of my students with a very low level of English was trying to tell the customs officer her purpose of visit. The envelope that she handed to the officer included some complicated paper work. So, my student wanted to help and leaned towards the officer and put her arm through in the glass. That moment was the scariest memory of her. The officer went for his gun in a tiny fraction of time and yelled a ‘Put your hands up!’. She was questioned for half an hour after this incident. Most Americans are religious. All Protestant denominations accounted for 51.3%, while the Catholic Church by itself, at 23.9% is the largest individual denomination. God is the Father, Jesus Christ is the Son and there is Holy Spirit. This is what they call ‘Trinity”. In Catholic belief, Virgin Mary is holy. Christians’ holy book is holy Bible and they worship every Sunday at church. Unfortunately, I’m not a very knowledgeable person when it comes to religion, but please do some research before you come to the States. I highly recommend going to church one day, it is a remarkable, interesting experience. When you are driving, if a police officer stops you, DO NOT LEAVE YOUR CAR. Pull your car off the road, stop your engine and wait. There might be an awkward 5 minutes that you are sitting in your seat and the officer is sitting in his seat. What he is doing is that he is communicating with the main office and trying to gather information about your license plate before he talks to you. Also, don’t even try bribing. Bribery is one of the biggest offenses in the States. You can literally go to jail. When the police officer stops you, just pull over, roll down your window and wait in your seat. Americans love socializing and entertaining people. You will find yourself eating and drinking out a lot. Watch those pounds on the scale! I have personally gained 22 pounds (10 kilos) here! Their burger, fries, BBQ and pizza are the best! Make sure you exercise daily! Although Americans are famous for the high obesity rates, they are also aware of self care. Most Americans that I met don’t smoke, and more than half of it exercise daily. It is such a great motivation (!) when you open your mouth to eat that juicy greasy slice of pizza, you see those runners outside running in snow with their perfect bodies. Another reason why it is easy to get fat here is the amount of variation. Variety of snacks, alcohol, soups, sauces, Indian food, Viatnemese Pho, Chinese dim sum, Korean BBQ, Italian lasagna, Brazilian steak… You want to try all. Then you get fat. Choices, choices, more choices. A liquor store in Chicago, IL. Before traveling to the US, you hear all bunch of things from your family and friends. Usually scary things. Because they worry about you, they tend to focus on the worst all the time and force the limits of stereotyping . Before my American Journey started I had heard things like “There is racism there, you will be discriminated, get ready!” “They don’t like people from Turkey, they don’t like Muslims, look what they did to Iraq” “They love guns, you might get shot” etc. I remember when I first arrived in Lawrence, Kansas in January of 2008, the first thing I realized was (besides the bone chilling cold) how big everything was: Big cars, broad highways, large parking lots, the houses were big, too. Then I went to a restaurant. Oh… Those portion sizes! With one portion in the US, you can feed 3 people in Turkey, easily. What surprised me the most was the fact that people were so respectful and friendly. There were no judging stares, no cutting in line, no honking when the light turns green in traffic. People were so patient and positive (well, most of the time 😀 ). Let me make this clear here. I do believe that not everywhere in the US is the same and without being in every state, meeting a lot of people from different levels of status, it is really hard to say what American culture is like for 100%. But I can share with you my experience so far, and I don’t want to offend anybody, I just want to share my observations and experience. If you had a different opinion, please feel free to comment below. I have lived in KS and IL for 3 years each and I have been living in Boston, MA since October 2017. I also had a chance to visit New York City, New Jersey, Los Angeles, Orlando, Miami, Las Vegas, Boulder, many places in Utah, Iowa City, Cleveland, Hartford, somewhere in Arkansas, St. Louis, St. Antonio, Atlanta, Kansas City, Bronson, Wichita, Topeka, and Detroit. So my experience comprises those places only. Anyway, where were we? Kansas is considered as part of the Midwestern Culture. The stereotype for Midwestern culture is friendly, neighborly and a laid-back. Also, they tend to have a neutral accent, which makes it perfect for an international student (It was awesome for me). Chicago, Illinois was my second home and lucky me, IL was a Midwestern state as well. On this page, I will try to write about my my understanding of American culture and I will often compare it to my Turkish heritage. If you are an international individual who wants to travel/move to the US, or an American who is curious about how their country is perceived by a foreigner, or a person who is just curious about American culture, you are going to enjoy my posts! – At least I hope so!